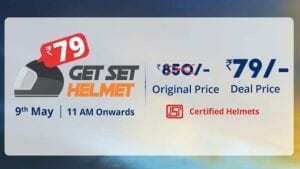 Droom.in – Get Helmet at Rs 99 only on 13th March (Register Now). Droom.in website is offering a “Flash Sale” where you will get the Helmet at just Rs 99 only. You need to register for this Flash Sale and after that Droom notifies you via SMS & Email. So Hurry up and register for Flash Sale !! Use Droom App for Faster Ordering. The Original price of Helmet is MRP 999 which is going to be sold at Rs 99 during Flash Sale which is available on 13th March at 11 am. So Ready for this Sale. 7) Also, Sign up on droom for Fast Checkout. Founded in April 2014 in Silicon Valley, Droom is India’s first & largest marketplace to buy and sell new and used automobiles and automobile services. Droom has taken a completely innovative and disruptive approach to building trust and pricing advantages for buyers. The current experience of buying and selling an automobile is completely broken, antiquated and full of pitfalls. Droom offers a truly 21st-century experience in buying and selling automobiles.